This Rumble ended on 2003-04-01 00:00:00.0. Blonde Friend: Laurana, a hottie who is married to a backwoods half-elf. Brunette Friend: Kit, a black haired beauty who is fun to take out for a spin. Uniform: Colorful, flashy bright blue leggings. Accomplishments: Freed a talking wooly mammoth from two gnomes with an insane Life Quest, visited an underground cavern where plants live off the air, traveled back in time, traveled forward in time, traveled to a whole new timeline, changed into a mouse, turned evil by minotaurs, changed into a gnome, made friends with a god, and made fun of a dwarf... ect... ect. Death: Became a pancake when he was smooshed by a huge god named Chaos. Troubled Waters: A friendly fishing trip turns deadly when Tas watches Caramon try to catch a fish with his bare hands and almost drowns Flint in Crystalmir Lake. Blonde Friend: Pamala Anderson a hottie who is married to a backwoods redneck. Brunette Friend: K.I.T.T, a black painted beauty who is fun to take out for a spin. Uniform: Colorful, flashy bright orange bathing suit. Accomplishments: Prevented a band of African revolutionaries from stealing nuclear missiles from the United States and, incidentally, won $50,000 in a crap game in Las Vegas. Death: Became distraught when K.I.T.T. was smashed by a huge truck named Goliath. Troubled Waters: A whitewater rafting vacation turns deadly when Hasslehoff is pursued by murderous miners in California's gold country. Tasslehoff looks over the side of the rolling gnomish sailing vessel. "Are you sure that this whirlpool goes clear through to the other side of Krynn?" he asks, leaning further over the side of the railing. "Because, I had some friends that went down in the middle of the Blood Sea, and that whirlpool was supposed to go to the Abyss, but they only ended up in the underwater city of Istar. I wish I could have been with them, because I've been to the Abyss and let me tell you, it was no fun at all." The gnomes bustling to and fro on deck ignore the kender as they attend to their many duties. Thinking that he sees something sparkling in the depths the kender leans out even further and falls into the swirling watery vortex. After a perilous yet extremely exciting ride through the violent waters Tas reorients himself underwater and begins to swim towards a shining light above. Coughing and sputtering he reaches the surface out of breath and out of energy. He thrashes around trying to stay on top of the water. Ever alert, David Hasslehoff looks out over his section of beach. The sun shines down on his perfect tan and the wind plays with his curly hair. All around him women in small bikinis run in slow motion as he lounges on the hood of his '84 Pontiac Trans Am. A voice emanates from the car "Michael?" "My name is not Michael it's David. I've told you a thousand times. What is it? I'm busy watching the beach," says Hasslehoff. "Sorry to disturb you Michael, but you might want to look past the walking flotation devices and out into the water. I believe someone is drowning," the car says a bit miffed. Reacting in a heroic fashion Hasslehoff grabs a life saver and runs into the water, grabbing the sputtering kender and hauling him out of the ocean. Tasslehoff recovers and looks around his strange new surroundings. 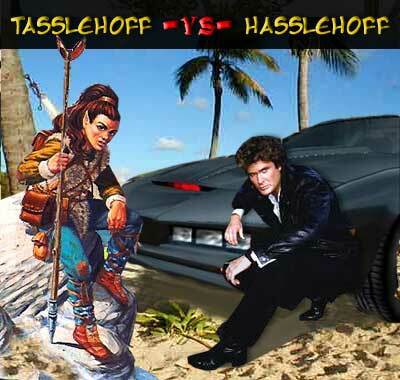 He fires off a hundred questions in a matter of seconds confusing Hasslehoff and then he sees K.I.T.T. "What is that? Why that is the fanciest looking gnomish invention I have ever seen!" Tasslehoff rushes towards the car, just as Hasslehoff recovers and lunges for the kender.